All Aspect Printing carries a wide range of colors of Plastisol inks. Plastisol ink is the most popular ink used in screen printing today. Plastisol ink sits on top of the garment as opposed to dyeing the fabric. Because of this, plastisols are the most commonly used inks for printing designs on to garments, and are particularly useful for printing opaque graphics on dark fabrics. Plastisol inks will give you the most vibrant prints. Screen print plastisols are made up of two primary ingredients – PVC resin (a white powder) and plasticizer (a thick, clear liquid). Plastisol inks are easy to use because they don’t dry until exposed to heat in order to dry. Plastisol ink will not dry, or cure, at normal temperatures. For a proper cure, plastisols must reach a temperature of 300-330° F (143-166° C). One of the biggest advantages of plastisol is that it will work on just about every type of garment, providing the brightest prints that you’ll be able to achieve. It will allow you to manipulate it in many different ways to have different applications. Plastisol inks work on just about any type of fabric. For less pourous fabrics, ink additives can be used to help create a better bond with the material. However, a word of caution about ink additives, it’s easy to upset the chemical balance of plastisol inks by using the wrong additives or by adding too much of an additive – even if it is the correct additive. The result can be ink that never cures properly, a problem that may not be discovered until your customer washes a shirt and the design falls (i.e. color lose, adhesion or cracking). To avoid this problem use only those additives recommended by the manufacturer, and read the technical data sheets for each ink and additive, and carefully follow their instructions. 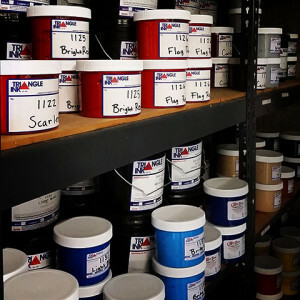 Plastisol inks can be purchased from just about any screen printing supply website or store.